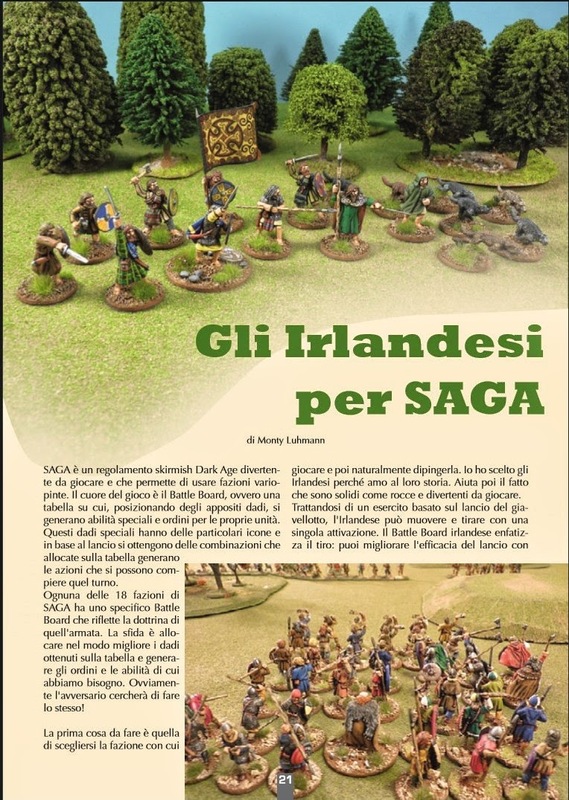 The current issue of Dadi & Piombo wargaming magazine features an article I wrote about SAGA, accompanied by photos of the Irish warband I painted. I've let this go to my head, telling people I'm now big in Italy. This is my first time published and it feels really good. Here's hoping it's not the last time! As I wrap up the Spartans, I've got my next 15mm ancients army primed up and ready to go. Featured prominently on Trajan's Column, I'm hoping they'll be an interesting army to paint and play in our Field of Glory campaign. Congrats on getting your work published and I'm really looking forward to your next 15mm project! The beers are on me Monty! Well deserved congratulations, Monty! It is fun to see your name and work in print, isn't it? It really is! There's an old song that keeps going through my mind, "The Cover of the Rolling Stone." It's not quite that but I'm thrilled just the same! This is just grand!! And I had the good sense to follow you before you were famous! Congratulations and here's to more publications in future! Congrats Monty. Very good news. I do hope to notch a few more! Bravo Sir, fame at last! Thanks Michael! I do hope my dear wife can cope with the extra female attention such fame will surely bring me. I will drink to that Monty well done ! Andrew, I'd so love to raise a pint with you, and your friends. Thanks! Congratulations Monty! Well deserved with all the effort you have been putting into SAGA!!! Thanks Burkhard! Yea, last year was all SAGA, all the time. Thanks Caliban! To celebrate, lets see the Iberians stick it to the Romans. Fame at last, well deserved. It only took 52 years of careful seasoning! Published, and in Italian as well! Is there anything this man can't do? Thanks Evan! I'd like to say "no" but then my wife will likely ring in and set the record straight. Oh wait, she doesn't read my blog! Marco, I'm merely following in your footsteps! Congratulations! It's a great feeling. Keep on producing, your stuff looks amazing. Historian, thanks for ringing in. And I see you just published some rules so, wow! That is impressive. Congratulations Monty! That's very cool. Gilles " the way of the (spray) gun "
You and me both! It sure would come in handy in a visit to Rome. Big in Italy is big everywhere! Seriously, I always dreamed of being in the White Dwarf. Had my 2003 GT tourny army featured online, but never made it into the mag. Could care less now (about WD), but getting something into Wargames Illustrated or have a pic or two make it into some Black Powder etc. book would be way cool. So yeah, I think I know how you feel, and it's ok to be totally pumped because you should be! Well done sir! LOL, sure, if you have a copy of the Italian magazine! I've said before that your WH tables could glide right into White Dwarf! I completely missed reading this update. Just awesome and congratulations!